I can’t tell you how many times I’ve wanted to show a keynote presentation, or flash up a spread sheet on my iPad and I haven’t had my VGA adapter handy and have had to go through the well documented workaround of screen dumping each slide to a photo and then using Airplay to show my photos. 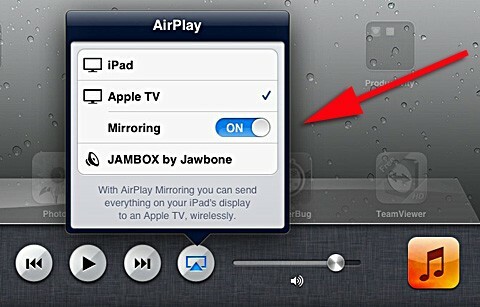 Could this be what I’ve always wanted and thought the iPad needed … wireless transmission from the iPad to a large screen for all apps, not just those that supported Airplay? Indeed it is exactly that… one of the coolest features in iOS5 and one that hardly anyone knows about… and to turn it on couldn’t be simpler. Voila, on your TV you’ll see your iPad desktop and it’s just like having a large monitor or projector connected… every app I’ve tried has worked just fine. So, if you’re a business user nip out and spend a very modest £100 on an AppleTV box and stick it in your boardroom. Not only will you get even better use from your iPad you also get the wow factor with your visitors. PS.. make sure you download the latest update for Apple TV once you’ve installed it.